Could Marijuana Lounges Be the New Beer Gardens? 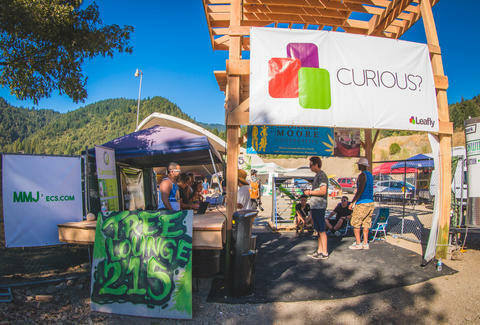 If you’re familiar with festival culture, you know cannabis lounges are a long time coming. Cannabis has been intertwined with festivals since Woodstock and well before -- and that’s not to mention the pivotal role that it has played in the development of every genre from jazz to rock 'n' roll. Yet it’s far more typical to see plumes of smoke and vapor emanating from a packed main stage crowd in the minutes before a show than it is to see enthusiasts relaxing and consuming together at the same place and time; there has never been a dedicated space for patients to take a breather and medicate compliantly. Thanks to this first event’s success, Kofmehl says her team plans to use the experience as a template to bring cannabis lounges to every existing cannabis market in the foreseeable future. The following are seven reasons why this historic phenomenon could become the beer garden of our generation. On the third day of Northern Nights, with the Mendocino County redwoods as my backdrop, I found myself lining up to smash a Donald Trump piñata full of cannabis samples. Where else could this have happened but at a cannabis lounge? Nowhere, that’s where. 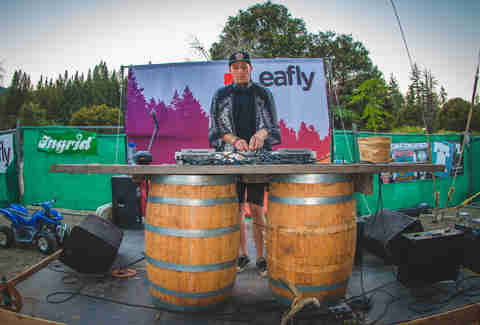 At 4:20pm at the Tree Lounge, comedy acts took the stage; in between, DJs spun chill electronic beats and throwback jams as the crowd grooved along. A young female rap artist hopped onstage for an impromptu verse. Near the lounge’s towering archway entrance, an artist painted a surrealist sculpture in vivid neons. The crowd, kept elevated and smiling by sponsors offering free dabs, was receptive to every act that went onstage. Playing to such a blissed-out group is every artist’s dream come true. In the future, expect the incorporation of larger art installations, elaborate interactive décor, supplementary musical programming, art installations, refreshments, meet-and-greets with cannabis-friendly headliners, and more. 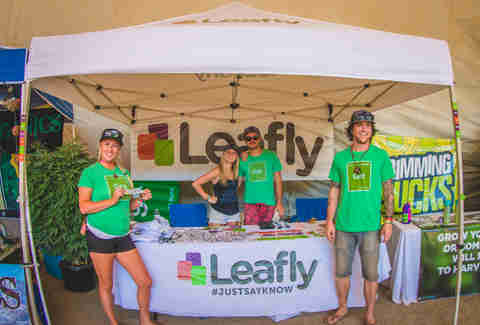 Shaded by the über-tall Tree Lounge tent, a central lounge area was dominated by comfy seating and wide swathes of carpet, where cannabis enthusiasts of all stripes – from new patients to OG activists -- kicked back in beanbag armchairs, made new friends, and struck up conversations. Meanwhile, growers, trimmers, and other professionals also jumped on the opportunity to network and share feedback; they walked back and forth from each other’s tables all weekend, toting jars of faultlessly cured flower, offering whiffs, and trading nugs. For those who don’t consume cannabis themselves, standing in a cloud of joint smoke while attempting to enjoy a show isn’t ideal; furthermore, some families attend music festivals with children in tow, and may not appreciate open consumption around their kids. Twenty-one-and-up cannabis lounges, which require a valid medical card where applicable, solve both problems. In 16th-century Germany, a decree of brewing regulations known as the Brauordnung stipulated that no brewing could take place in Bavaria between April and September. In response, brewers dug cellars to store their beer at lower temperatures over the hot summer, and planted shade trees above the cellars to aid in cooling. It wasn’t long before thirsty Germans decided to put tables and chairs beneath the shade trees, where they spent their summers drinking instead of brewing. The modern American beer garden evolved from these original German iterations. 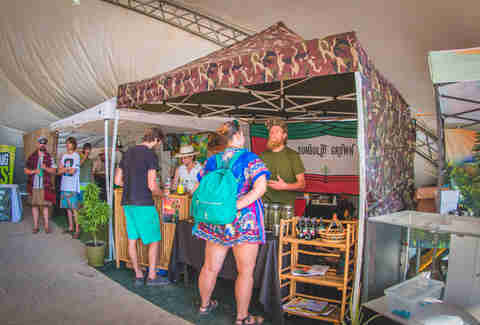 Alcohol, though, has earned a reputation for breeding aggression, and some festivals – like Shambhala in British Columbia – have banned it entirely. Other, such as What the Festival in Oregon, ban glass containers, a provision which prohibits a good portion of alcoholic beverages. What better to take its place than cannabis? We may be biased, but we can’t think of anything. Jeremy,* who visited the Tree Lounge with two friends, agreed. “The whole 215 tent in general has been a great experience,” he said. “More music festivals should have a space like this – it brings super-positive vibe and a lot of unity.” Carson,* a lighting designer from Los Angeles, added that he one day hoped to see cannabis lounges at more places than beer gardens. Proposition 215 legalized medical marijuana in California twenty years ago. Today, medical marijuana is legal in over half the United States. The natural next step is for states to accommodate patients’ needs with spaces for legal consumption. “Everybody’s [been] doing it behind the curtains and kind of hiding because of the laws,” said one attendee, Joe,* of cannabis consumption at festivals. “A lot of it is backstage, you know? You can’t fully be out there.” But as cannabis ubiquity and acceptance have evolved, phenomena like cannabis lounges will continue to help sew cannabis ever more tightly into the fabric of American life, and vice versa. In short, if you’d expect to see beer gardens a certain event, expect to see cannabis lounges cropping up alongside them more and more over the next few years. *Full names withheld to protect patient privacy. This article was originally published as Are Cannabis Lounges the New Beer Gardens? Here Are 7 Reasons Why They Might Be. For this and more articles on cannabis news and culture, visit Leafly News.